Cfarr, Matt, Marco, JMac, Brent - nice weeks. I am DNS for the race. It is near home, and there is a big train outage, so I cannot make it. Really hot, so it would have been slow. Wife is racing too (beginner), it is record temperature near home so it will be tough. Watson is referring to the heat wave currently crossing the country (bummer about your race, Watson, but it would have been a pretty poor day for it). And before JMac starts laughing and/or distributing strikes, the temperatures in Wellington today broke a long-standing record (warmest on record), while Auckland was also pretty hot (the temperature at Whenuapai Airbase, near where I live, was the 3rd warmest on record since 1945). Upper Hutt where the race was, had official high of 33.5 Celsius. It would have been around 31 at race time. I did find it funny that one of the main news sites had live updates about a hot day in summer yesterday! Admittedly I did live in Melbourne for 9 years where a heatwave was 10-15 degrees (C) higher than what we're currently getting in NZ. Anything over 25C is tough running conditions for anything but an easy run though. It turns out my calf spasms were just that - I set out on last night's run intending to take it as it comes and despite no pain I considered just keeping it easy with a temperature around 30C but thought "f**k it, might as well as least find out" so I did 5x1km tempo and managed comfortably. In fact, 10-15 seconds faster than HMP. A good lesson there! Still keeping a watchful eye on the calf though and upping my electrolyte intake. Yes! Now 95 is hot! You show them who's boss Flavio! Well actually I'm the boss but you know what I mean. We are experiencing the exact opposite this week, lows in nyc going down to 5 degrees with wind chills at - 15F/ -25C. Running in that is going to be fun! To everyone complaining about your hot summer weather... Today, our "feels like" temperature is supposed to be -50 to -60 F. Not supposed to even reached a feels like temperature of 0 until this weekend. School has been cancelled today and tomorrow for all area schools. CommanderKeen - I saw in another thread you run on Zwift. I've run about 1,100 miles on this since May. Chances are we've passed each other or run together. Do you ever join any of the group workouts? ocramireob - 240 for the month is awesome. I've run all of my best marathons when I've had a long consistent stretch of high mileage. I've been feeling really good about my running this month and you're 40 miles ahead of me! matthewfschwartz - Oh wow... sub 2:45 is cruising. Based on your mile time, though, you certainly ability beyond a 2:54 full. This coming from a guy with a 3:06 full PR, similar half marathon times and NOWHERE near your ability in the 800 or mile. What kind of training plan are you using? Have you run Boston before? I ran it once... had an AWFUL race and it was still probably my favorite running experience ever. Mark - I had two years where I hit 3,000 miles and those were BY FAR my two best years ever. I basically PR'd at every distance. I've had three mediocre years since then, but I'm hoping to get back to that nearing 3,000 miles kind of shape again. I'm not a runner that can quickly get back into top form. It takes me like 2-3 months of 50 miles and I start to feel like myself again. JMac - 2:50 shape? Sounds like you just need to buy a pair of those $250 Nike 4%. 4% off of 2:50 is 2:43. Boom! Instant PR!!! Flavio - The part you don't mention about getting stronger is that it's totally miserable. I wish I was motivated more for strength training or stretching. Maybe makes me crazy that I'd much rather run 20 miles on a treadmill than pick up a weight. Flavio - 55USD /month? Does your coach have anything against coaching someone from out of the country?? There's a local running studio (really nice Woodway treadmills for indoor group workouts, weights sessions, track access) that is 200USD /month for a custom plan plus unlimited access to the above, while I know the "other" local runner uses a guy (Thomas Schwartz, AKA "Tinman") that's ~150USD /month. You're getting quite the bargain! Now that weather is more what I'm used to! Dead serious, that Kiwi Point + temperature is very typical for early mornings in the late spring/early summer around here. Out of curiosity I looked up how far you are from the equator compared to me. I'm ~374mi/602km farther than you are, which really isn't that much in the grand scheme of things. You are FAR closer to large bodies of water, though. Watson - Bummer about the race, and the conditions. I keep an old pair of running shoes and some shorts/shirts in my car for just such an occasion! Brent - I think I've got a little farther on Zwift, but I started last January. We probably have at least passed each other at some point. I've never done any of their group workouts - they just haven't lined up with when I run. I'm curious as to how they'll price the service when they finally get it out of beta. I really think $15/mo (what they currently charge for biking) is WAY too much considering that they can't actually control a treadmill to simulate a course or execute a workout like they can with a bike trainer, plus there really aren't that many runners on it so the "social" aspect is a bit lacking as well. I got outside (a little later than I wanted) and had a really good run this morning. Great weather (20F/-6.7C), with a hardly noticeable wind. Intervals again, this time 7x 800m. My calf didn't bother me at all until the last 1/4 mile (and then only felt fatigued), while my glute could be felt but didn't hurt or hinder anything (kind of a strange thing to describe). So it seems like my couple (extra) days off plus lots of stretching/rolling has done me some good. So, about this lack of motivation thing: Right now I'm going to target that early June HM for a PR attempt. Depending on heat I may not actually run it, but it'll be a good target for me since it's a PR course that *could* have nice weather, and I don't know if I can definitely be in PR shape for any distance before that. If I don't race it (only skipping because of heat) then no big deal, I'll just roll that fitness toward a fall goal. Tentatively thinking of targeting a marathon with a fast course (though possibly warm weather) in mid-October that's pretty popular as a "close, but not local" option for local runners, or a half in Dallas, TX in early November. The only real worry about the full is that it's a week after a HM I'm already planning to run. I could certainly do that as an easy training run, but I'd like to win the blasted thing this year I I can. Keen/Flavio - my coach is NZD$30/week, so that would be about US$80/month. That's definitely a bargain you're getting there Flavio! Steve - good news on the calf (I saw your tempo session on Strava and figured that was the case). Brent - ok that's seriously cold. Do you remember from RWOL, Underslept Dad and how he'd run outside in Montreal in -30 C / -22 F? LOL Brent will always win the harsh weather competition. I recently saw a documentary about a very cold city in Russia where the temps are around -45 to -55C. At 8:45 a dude shows a few tricks. One of them is throwing boiling water from a pan in the air. The water immediately freezes and drops like snow. I wonder how many people die every year in Minnesota due to silly things like locked the door and forgot the keys inside. Yes, it's really bleeping cold right now. 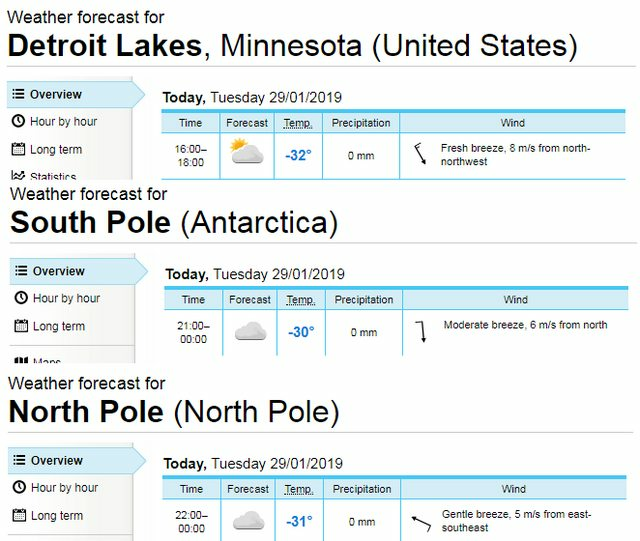 That's interesting that the north pole is the same temp as the south pole given we are at the hottest/coldest point of the year for each pole. Weather nerds, get at this problem! The current heatwave is mild compared to what some of you go through for sure. Our sun is a burner though. Very harsh due to the hole in the ozone layer above us. 30 mins in the sun will burn you up. My 5am starts haven't been helping as its already 22c. Watson probably not a bad 5k to miss. It would have been miserable.